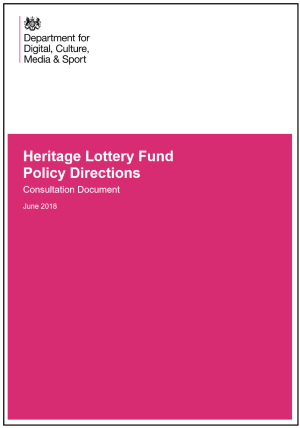 Government is consulting on the ‘Policy Directions’ for The Heritage Lottery Fund (HLF) – the largest dedicated funder of the UK’s heritage – ‘which are being revised following a recommendation in the Tailored Review of the HLF carried out in 2017’ with the consultation closing on 29 July 2018. This consultation seeks views on whether the revised Policy Directions adequately cover what HLF should take into account when allocating grants, and whether there is anything that HLF does that is not included…. The Heritage Lottery Fund is an important national institution for the conservation and celebration of heritage in the United Kingdom. As the UK’s largest dedicated funder of heritage, it has given over £7.7 billion of National Lottery money to more than 42,000 heritage projects since its launch in 1994. The diversity of its grant recipients is vast, with projects ranging from buildings and monuments, to landscapes and natural heritage, to museums, archives and libraries, to community heritage and the history of place. The Heritage Lottery Fund carefully assesses each application for funding to ensure that its grants enable communities in all corners of the UK to explore and understand their heritage and to protect it for future generations. Last year’s Tailored Review of HLF and HLF’s recent consultation on its future Strategic Funding Framework have both demonstrated how vital HLF is considered to be by both the heritage sector and public. Its grant giving is crucial in ensuring we retain and better utilise our most important national heritage. The government’s Heritage Statement outlined a series of commitments to ensure that our heritage is better supported and HLF play a large part in this. These Policy Directions aim to provide HLF with the right framework to properly equip them to do this. They aim to strike a balance between getting on with the job in hand and ensuring that key strategic priorities are factored into their grant giving to preserve and promote this country’s vast heritage. Now more than ever, it is crucial that National Lottery funds are targeted where they will have the most impact. The funds distributed by the Heritage Lottery Fund comprise public money, for whose management government is ultimately accountable to Parliament. The Heritage Lottery Fund is a UK-wide distributor and must tailor its focus to specific objectives in each of the nations. The devolved administrations in Scotland, Wales and Northern Ireland will be revising their own Policy Directions in due course to set out the key heritage priorities to be addressed by HLF money in each region. My counterparts are in agreement with the priorities outlined in the proposed UK-wide Policy Directions. I invite you to review the proposed Policy Directions and to respond to the consultation, either as a member of the public or as a stakeholder in the heritage sector. My Department will consider all responses received and will amend the Directions if and as required, before issuing a final version to the Heritage Lottery Fund in Autumn 2018. We look forward to hearing your views.